There’s a lot of conversation and laughter among the regulars of one very unusual social club, in Hastings, East Sussex. 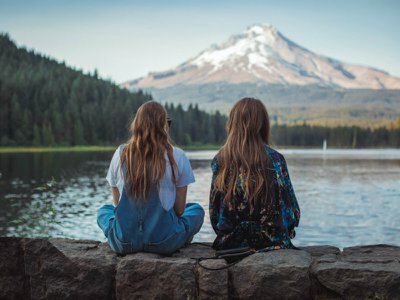 Some are retired and have joined to make new friends and be creative, while others are living with a terminal diagnosis and are making the most of life. But this is no coffee morning. They are all here to learn something entirely new and ultimately prepare for their future. At this social club, they’re decorating their very own bespoke coffins - with the aim of bowing out in style. Welcome to Coffin Club UK. “What happens at Coffin Club, stays at Coffin Club,” joke Kate Tym and Kate Dyer. Their UK-based DIY coffin scheme was inspired by a build-your-own coffin project established by a community group of seniors in New Zealand. Kate and Kate launched their create-your-own-coffin workshops with the aim of bringing older people together to make something unique, forge new friendships and chat openly about death and end of life matters. In New Zealand, the coffins are built from scratch, but the UK Coffin Club get its cardboard coffins supplied from Earth to Heaven in West Sussex, an eco-friendly coffin company which provides cardboard coffins ready for self-assembly and decorating. Coffin Club’s six-week courses take place on Wednesday mornings, with guests speakers from the funeral industry among those who are invited to join the conversation and answer questions about funerals and end of life matters. “Within the first five minutes of the club starting, everyone starts bonding and getting along,” said Kate Dyer, who says that the club has provided a safe space to openly speak about death. Among those taking part in the latest course, is a Coffin Club member who is in remission after cancer treatment. 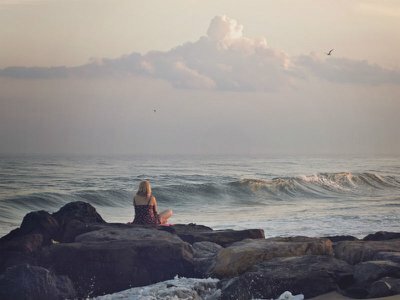 Another who has embraced the creative challenge is a widow whose husband died several years ago, and was looking for a solution to work through her grief. Since joining Coffin Club, she has been able to “let go” of her husband’s ashes, and openly speak about the loss of her partner. His ashes are now scattered into her very own coffin, which she has been carefully decorating under the guidance of Kate and Kate. 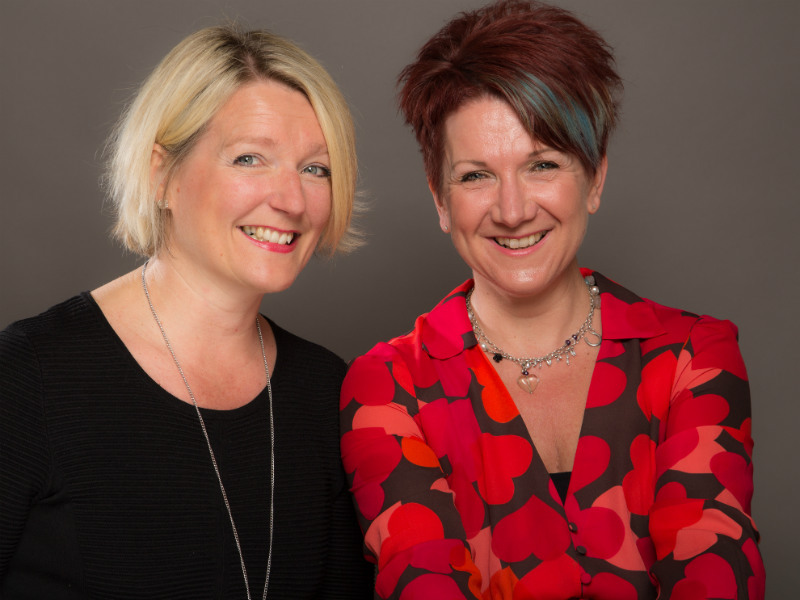 The Kates say that as well as bringing people together, Coffin Club helps make them aware of the many choices they have, when it comes to planning a funeral. This attracted attendee, George, who initially came to Coffin Club for pragmatic reasons. 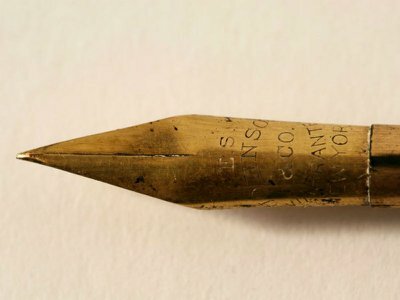 Although George is still looking to a long life ahead, he is planning his own funeral, so that his children will not have to worry, when the time comes. Coffin Club has helped him explore the many funeral products and services available, so he can put together his own. 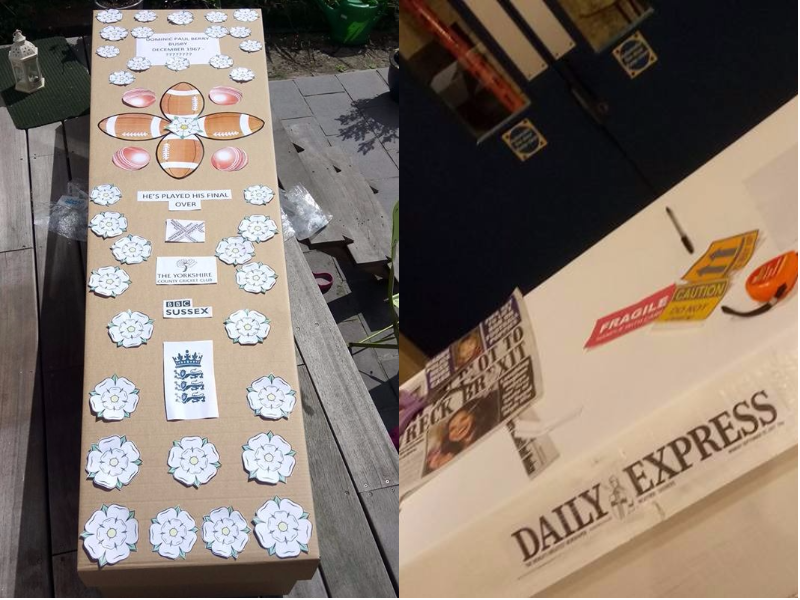 As a former employee of a national newspaper, George has gone with a newspaper theme for his unique coffin. He has decorated it with newspaper headlines about various milestones in his life. 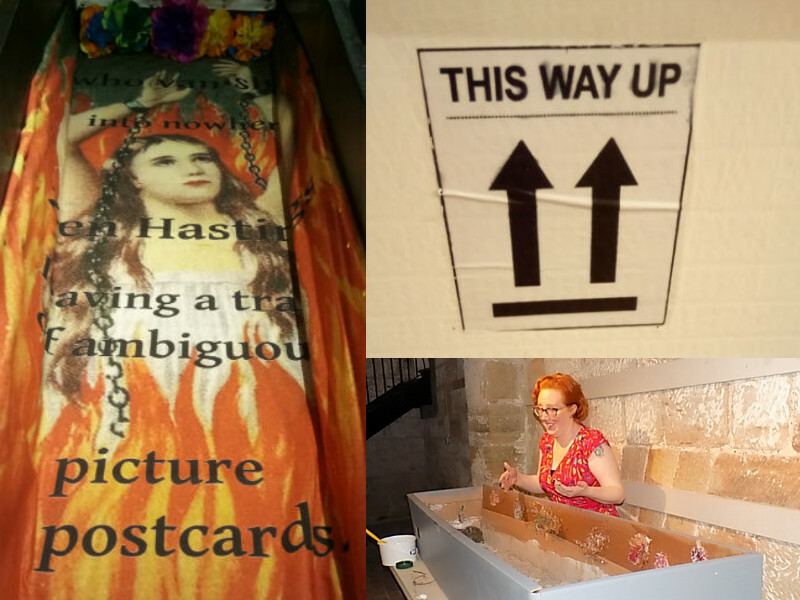 Elsewhere in the Coffin Club workshop, another DIY coffin has been decorated inside and out with maps of places that hold special significance for its maker. Another Coffin Club member has created a beach scene on her coffin, which is covered in sand, stones and rippling waves. 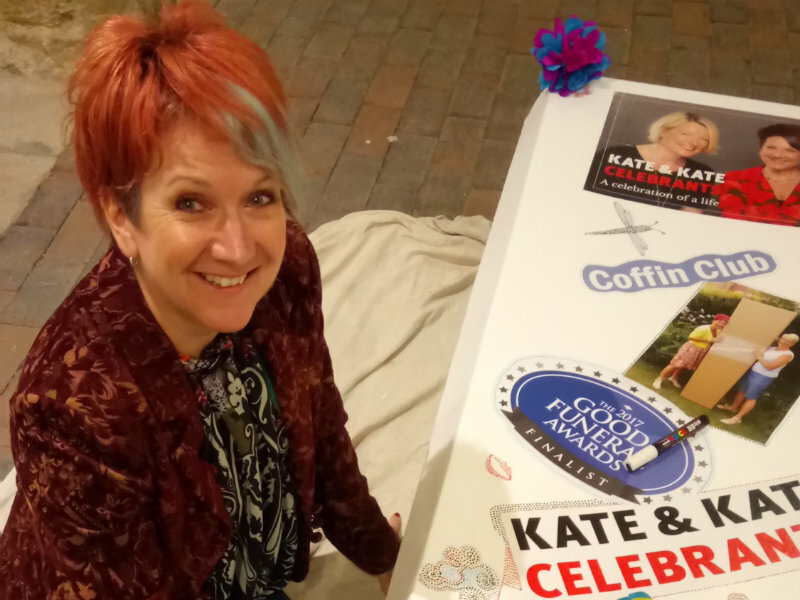 The Kates have been busy with paints, motifs and stencils, too, to create a coffin they’ll be able to take to events, to inspire more people to join Coffin Club. Kate Dyer is toying with the idea of a full-length painting of Kevin Bacon on the coffin lid – “so she can be buried underneath him” – sighs Kate Tym. 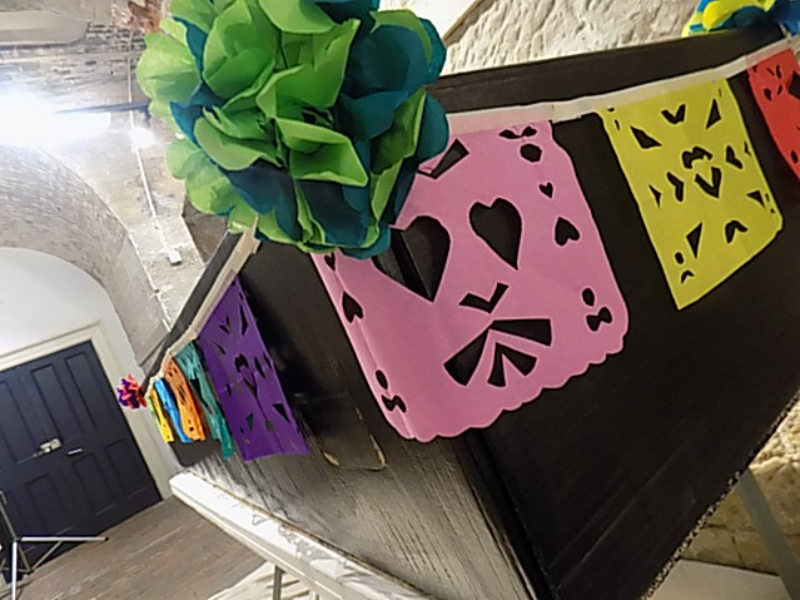 What do you do once you’ve completed your DIY coffin? After The Coffin Club course comes to an end you take your coffin home with you. The coffin can be conveniently flatpacked and stored away until it’s needed. 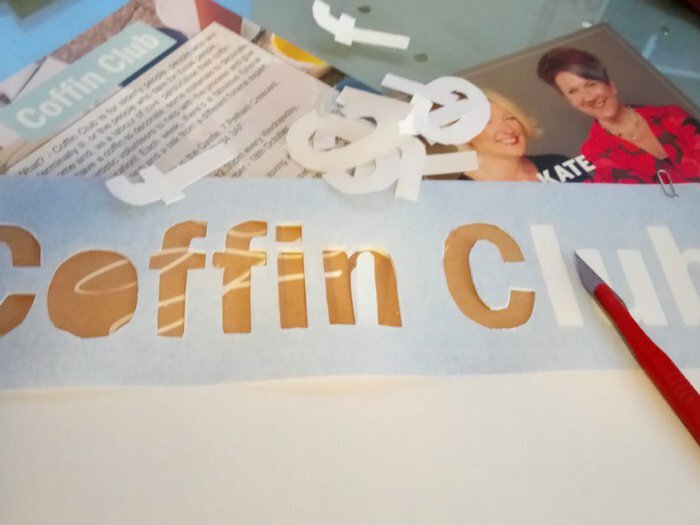 Whether you are nearing the end of life, or simply thinking about your legacy, the Kates say that for all concerned, Coffin Club is a labour of love. If you’re inspire to create your own coffin, places are currently available for the next workshops, beginning on November 1 and January 10. Coffins and all materials are supplied and the six-week course costs £200. William Warren’s Shelves for Life is an invention like no other. The clean-cut, contemporary shelving unit has a dual purpose – it converts into a creative coffin. First launched at the British Library during the 2005 London Design Festival, Shelves for Life is designed to encourage a sense of attachment to our belongings in a throw-away society and to ensure a lifetime’s use - and beyond. The Curve coffin is a modern, eco-friendly creative coffin made by Wealden Coffins in Kent. Designed for drawing on and decorating, some people ask funeral guests and family members to write and draw messages of love, while they can also be beautifully hand-painted in personalised designs to order. JC Atkinson makes and supplies Faitrade and eco-friendly coffins in Washington, Tyne and Wear. 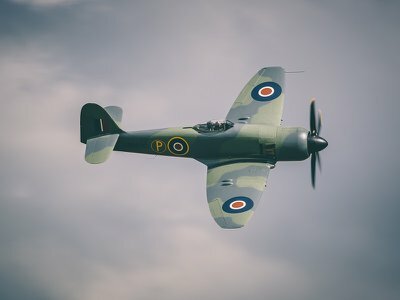 Its Reflections range enables bereaved families to personalise a coffin from a wealth of designs reflecting hobbies, scenery, lifestyles, or with photos from their own family album.